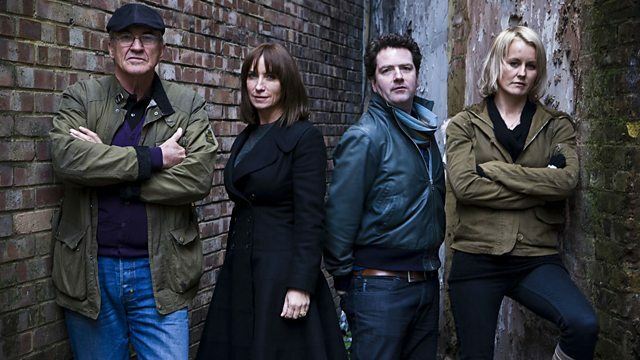 Actor Larry Lamb, television gardener Diarmuid Gavin, interior designer Meg Matthews and model-turned-mechanic Emma Parker Bowles swap their fortune for a world of joblessness. For four celebrities unemployment is about to become a chilling reality, as they start on their emotional journey for Famous, Rich and Jobless. Actor Larry Lamb, television gardener Diarmuid Gavin, interior designer Meg Matthews, and model-turned-mechanic Emma Parker Bowles put unemployment in the spotlight by agreeing to swap their fame and fortune for a world of joblessness, job-hunting and surviving on the poverty line and benefits. With everything they value stripped away, some old clothes and just under 10 pounds a day to live on, they have to adjust to being out of work, out of money, and out of their comfort zones as they discover what it is really like to be jobless in the UK today. The are guided and assisted by Emma Harrison, founder of A4e (the largest employment agency in the world, responsible for getting thousands of people back to work), and Craig Last, a former youth worker for the charity Centrepoint, who has helped many homeless young people find jobs. At the beginning of their eight day experience they are sent to four unemployment blackspots across the country, where they spend their first four days surviving on benefits and looking for work. Larry goes to Hartlepool, Diarmuid to Hackney, Meg spends her time in the Ebbw Valley, and Emma tries to find work in Wolverhampton. A night of constant rejections as he hunts for work makes Diarmuid get very emotional; Meg succeeds in earning some money by making friends with the locals in her community; Emma struggles to overcome her addiction issues to get a job in a bar and to get by; and Larry decides to eke out his benefits money as long as he can, to avoid any attempt to look for work. He feels that, in a difficult employment market, he would be considered too old.